Have you ever been in a situation where a song comes up on the radio or on TV, and you can’t quite make out its words. That happens to me all the time. That’s where apps such as mylyrics come in. Having access to song lyrics makes it easy to figure out what the singer is saying without having to guess too much. myLyrics is a cool lyrics app for iPhone that gives you access to an online lyrics repository that you can rely on to dig up song lyrics fast. The app also enables you to watch videos of your favorite songs on your phone (on YouTube). So you can follow the lyrics and listen to your music just to be sure. 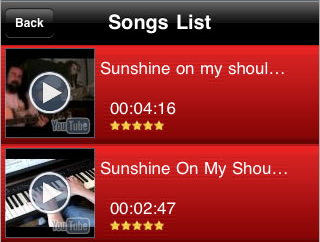 myLyrics comes with an easy to use interface and allows you to search and find song lyrics on your iPhone fast. You can search through songs by name, artist name, or both. You can save your favorite song lyrics on your iPhone as well. The fact that you need internet connection to access song information on iPhone is a bit inconvenient. But installing a huge lyrics database on your iPhone is not the best way to use your free space on your iPhone. 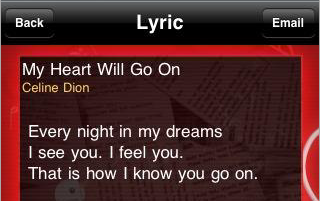 All in all, myLyrics is an easy to use app that lets you dig up lyrics of your favorite song fast. If you are a music lover, this is a handy tool to own.